Return to Order is a campaign to address the growing alarm, confusion and frustration at seeing our beloved nation [USA], a great temporal power, spin out of control. Already in our own time we are seeing a rising trend of immoral behavior besieging our nation on all sides, whether in the form of public Satanic acts against our moral principles or in the problems of youth growing up in a internet-ruled society, or the removal of Christian symbols to the slow degredation of the military. 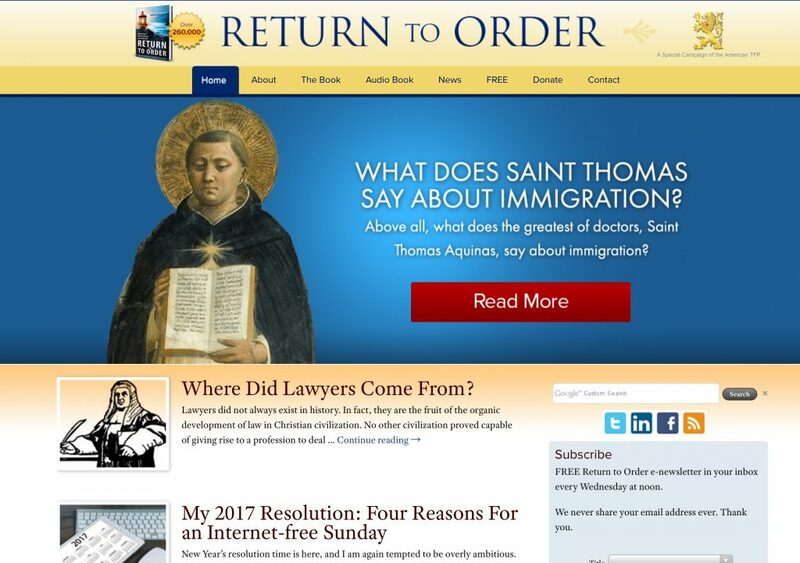 Free Book: Return to Order: Learn all about an organic Christian society, the solution for America’s socio-economic decline. The question for any patriotic and God-fearing American naturally arises: What can we do in the face of this chaotic breakdown? Return to Orders provides the answer, which springs from the heart of the principles that we hold so dear. It is a matter of great love of God and strict and loving observance of the commandments our Creator has laid down for us. In the light of this, the Return to Order campaign calls upon Americans to adopt not merely a literal interpretation of the Commandments, but, above all, carry out the spirit contained therein. It is a rallying cry for action. When the world calls for “tolerance,” Americans need to raise their voices for truth; when society is imbued with frenetic intemperance, Americans should strengthen themselves with moderation and self-restraint. All this will lead to an organic Christian society in which right and wrong can be differentiated and virtue can flourish. The book, Return to Order: From a Frenzied Economy to an Organic Christian Society–Where We’ve Been, How We Got Here and Where We Need to Go, by John Horvat II, is the fruit of twenty years of research and hard work, and is the backbone and doctrinal basis for this non-partisan, non-profit effort to help America return to order. Current events make the need for such a campaign painfully clear as our country faces multi-trillion dollar debt, polarization and paralysis in politics, breakdown in community, and the erosion of basic morality. Your participation can help America return to order. Mr. Horvat lives in Spring Grove, Pennsylvania where he heads the Tradition, Family Property Commission on American Studies.